I have two more posts before Christmas and then all my ideas will be exhausted--as am I. These last two I have the actual craft at home, but I forgot to bring paper to make it piece by piece. I hope you can understand the directions. The list of materials are the things I used, but remember nothing is written in stone. First take a piece of white construction paper and trace the child's hand, have them or you cut it out. The other pieces needed from construction paper are a round circle for a face, hat shape from red paper, a white circle for the ball of the hat, and two "petal" shapes from white for a mustache. 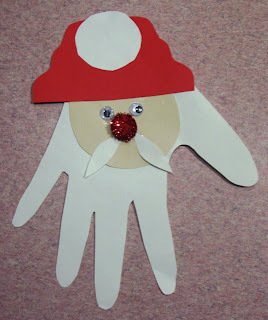 After the hand is cut out, the circle for the face gets glued to the palm, then the red hat gets glued to the top of the palm, and the two "petals" around the nose area for the mustache. Finally glue on the wiggle eyes and red pom pom for the nose. Some variations I think would be good--cotton for the ball of the hat, and cotton on the fingers for his beard. Have fun.